I didn’t go into this movie expecting much, and it still disappointed me. Seems like every time some Hollywood studio gets their hands on a video game franchise and decides to turn it into a movie, this is the kind of thing we get. I wouldn’t be so mad about it except that nothing in this film seems anywhere close to original at all. In fact, it seems to be cobbled together from summer movie blockbuster clichés and tropes, almost like a CGI-heavy Frankenstein. What’s probably worse is that it could have been somewhat passable if it held to the source material. There’s a weird kind of disconnect when a movie like Rampage (2018) has an actual arcade cabinet of the game it’s based on in the background of the corporate penthouse suite. Like, did they do this genetic-engineering research and name it “Rampage,” fully knowing that they’d create the exact creatures from the game? In any case, the whole plot is contrived and plays out exactly how you think it would. 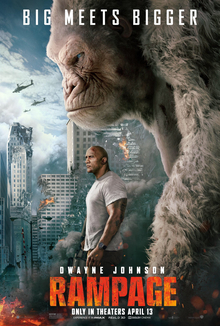 If only they had Dwayne “The Rock” Johnson’s character turn into an enormous white ape and destroy half of Chicago, then that’d be something I’d want to watch. One of the most significant problems with Rampage, aside from its sub-par CGI, is that the whole reason to even get to the point where monsters are destroying buildings (which was the entire point of the video game) was so poorly-thought-out as to be laughable. Like, what did they think was going to happen? Furthermore, once these monsters accomplished their destructive mayhem—the most satisfying part of the movie, by the way—you realize that it took pretty much the entire film to get to a 10-minute segment that lived up to its source material. Another poorly-executed video game movie, I give Rampage 1.5 stars out of 5.